Whether you are a professional services firm, a software or technology company, or a business offering tangible goods as a service, revenue management software should help you close the books quickly and accurately, while giving you a complete picture of your organization’s revenue. It’s not just about making your finance team happy. It’s also about centralizing all your revenue streams in one system, automating revenue calculations, and reducing period-end close. Getting a complete picture of your organization's revenue is never easy. Changing regulatory requirements to the new ASC 606 and IFRS 15 revenue standards, evolving business models, and over-reliance on manual processes can make the management of revenue recognition cumbersome. And a disconnected patchwork of manual processes, error-prone spreadsheets, and outdated systems will not help matters. An efficient revenue management software is not only key to your business’s profitable growth; it is also fundamental for your customers’ satisfaction. If your ordering processes are in one system, and your invoicing systems are in another, you are making room for errors, delays and miscommunication. With FinancialForce Revenue Management Software and financials you’ll get access to the best revenue management software that can embed your billing, payments and collections activity alongside your sales and service applications. 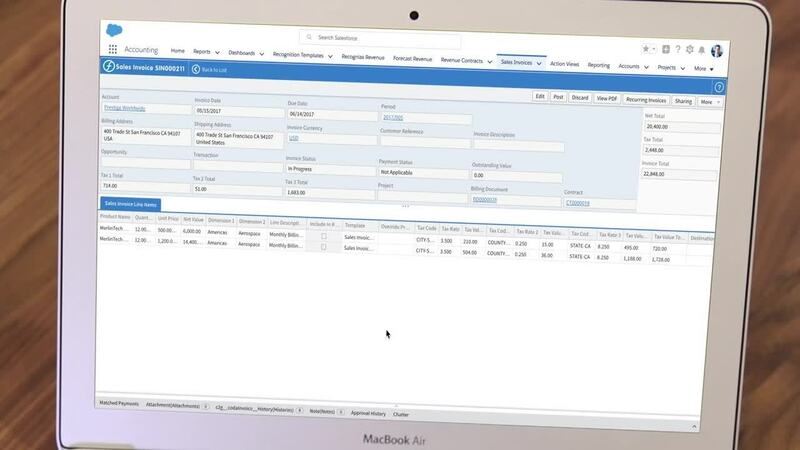 Simplify your revenue management process while improving the visibility of your revenue recognition information by managing it on the Salesforce Platform. Get the facts about revenue management systems. Download to learn more. The revenue management system from FinancialForce can give you a complete and analytical view of your revenue that is vital in order to maintain an efficient revenue situation. What to look for in a revenue management system? 1. Powerful, flexible data models: Revenue models continue to multiply, from product-based to SaaS to bundled and usage-based contracts. The right tool recognizes revenue from multiple sources, including directly from opportunities, orders, contracts, projects, and invoices. The data model should also handle complex use cases, including multi-element arrangements. 2. Seamless integration with other applications: The best cloud applications harness the power of your existing platforms (e.g. Salesforce) and integrate directly with your other applications including customer relationship management (CRM) and professional services automation (PSA). 3. Configurable templates and rules: The right tool enables you to adapt to whatever comes next. Create different rules based on your needs and how you want to recognize revenue. Find a tool that adapts to what’s best for your business—not the other way around. 4. Forecasting capabilities: Go beyond retrospective reporting to gain a complete picture of your business. A cloud application should empower you to derive revenue forecasting with both recognized and forecasted values on multiple revenue source data.